The long festering debate on what I’ve called the open space diversion disaster will be renewed tomorrow, when the Senate Environment Committee begins hearings on implementation legislation on the new Open Space funding formula approved by the voters in November. As I’ve written here numerous time, that debate was deeply dishonest, as supporters from the Keep It Green Coalition – as well as Legislators – repeatedly misled voters about the effects of the diversions on State parks and DEP environmental programs, fueled by a $1 million PR campaign. Do you approve amending the Constitution to dedicate 6% of the Corporation Business Tax revenue each year for the next 30 years? The dedication would be for the preservation of open space, farmland, and historic sites. The amendment would end the current dedication of 4% of that revenue for environmental programs. In addition, the amendment dedicates natural resource damages and fines to fund underground storage tank removals and cleanups and polluted site cleanups? The photo above illustrates just one example of this dishonesty. 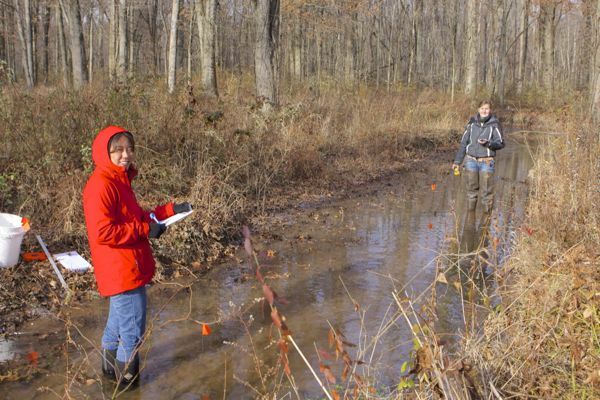 The women in this photo are conducting a stream survey for the Great Swamp Watershed Association in Harding Township, a community that openly touts a history of restrictive covenants. The results of this work can not be applied in any public regulatory decisions (e.g. does not meet QA/QC requirements), and is thus a form of private governance that literally duplicates DEP efforts. Specifically, the work that the GSWA folks were doing is done on a statewide basis by the DEP. DEP work can be enforced in DEP regulatory programs, like the Highlands Act, freshwater wetlands, and Clean Water Act and DEP land use permits. In a cruel irony, the specific DEP water quality monitoring, assessment, and watershed planning programs that actually conduct this work were slashed by the open space diversion and the funding of 123 DEP professional water resource positions was eliminated. When I asked these women if they were aware of the impacts of the open space diversion, they both said no. Both stated that this question was raised at a GSWA meeting and they were told that there were no cuts to environmental program, that the ballot question merely administratively “reshuffled” various funding. So the leaders of GSWA actually lied to their members too, as well as misleading the press and the public. Before we can talk about how to spend the $71 million the voters just dedicated to open space, we must first secure enforceable political commitments to restore the diversions from DEP programs (with the exception of the $17 million in diesel retrofit funds that would have been shifted to Parks on December 31, 2015. Those funds must be accounted for in the implementation legislation and allocated to Parks, for a subtotal of $32 million to State Parks, of the $71 million total). Of the $71 million, $32 million must be allocated to State Parks. Of the State parks money, at least 1/2 should be allocated to unmet and neglected urban needs. The Legislation should allocate those urban parks funds on the basis of a formula that looks at needs: i.e. there are indicators, such as open space and parks per capita or per land area, in each NJ town. This GIS based formula could also include a location and distance component, e.g. children and elderly should not have to travel more than 1/2 mile to access a park or open space. Similarly, a significant portion of the farmland preservation funds should be linked to programs that benefit urban residents, including farmers markets and community gardens. The USDA and Rutgers have done good work to map “food deserts”, communities that lack access to fresh fruits and vegetables. Just like the unmet parks and open space needs, these “food desert” communities could be targeted by a GIS based formula built into the implementation legislation. Hotter days increase unhealthy ground level ozone that triggers asthma attacks and respiratory distress. Heat waves also cause increases in mortality, particularly in elderly populations. Urban areas suffer extreme “heat island” effects due to all the pavement and buildings that store heat and the lack of natural cooling of shade trees and vegetation. All of this will greatly increase the current disproportionate burden born by NJ’s poor and minority urban residents. In addition to urban parks and community gardens, the legislation should include a major new commitment to urban forestry, as one means to offset the impacts of climate change by providing shade trees, parks, and open space. Historically, the NJ Open space program spending averaged something like $250+ million per year. That has been reduced to just $71 million, increasing to $117 million in 2016. Actually, available funds are far less when the $32 million in dedicated State Parks money is subtracted from the $71 million. The existence of huge unmet needs, greatly increased competition between traditional programs, and major new priorities that are not funded dictate the need for cost controls and a more efficient and cost effective program. Such controls include restrictions on purchase of regulated lands, revisions to land appraisal methods, and elimination of funding for private groups and undefined and controversial “stewardship” activities. Well keep you posted and hope to see you there. Even though it’s unfortunate that funding was lost on important environmental state programs, there was never enough man power at the DEP to monitor all the streams in New Jersey. The NJDEP water monitoring program heavily relies on volunteer based organizations to help monitor and gather information on all state waters. Also please state specifically why you think the data collected by thees volunteers is obsolete and does not meet NJDEP water quality standards? Volunteers who conduct these assessments have gone through rigorous training provided by the GSWA to properly conduct visual assessments. Not to mention a good number of volunteers for this organization are either highly educated in this field or are professional scientists. Another point, yes the women in this photo did state that they had no idea about the open space diversion and yes this question did come up briefly on a private conversation between a few volunteers, BUT it is absolutely false for you to say that this organization, specifically GWSA, purposely misled or lied to it’s volunteers! If you think they lied, then what did they say to us???? Please provide properly documented instance on what they said! Let me guess you can’t say, because they never did. And why do I know this, because I am one of the women in this photo (in which you did not get permission from me or the other woman to post this publicly to your website). Even though I agree, the state should have been made it more publicly aware the specific amounts that were being defunded and funded through this new amendment. It’s wrong for you to slander a reputable organization to try to help you make your argument seem more credible! And because of this, this makes me highly doubt anything you post on this is credible and truthful. The woman in the red jacket explicitly told me that the issues I raised about the diversions cutting DEP programs was raised at a GSWA meeting and that they were told by GSWA folks that there were no cuts, just “reshuffling” of existing money. Perhaps you were not present at the meeting she referrred to. The evidence was a personal communication – her own words to me. The KIG coalition repeated many versions of this lie, by saying that the DEP budget was set during the budget process and the Open Space Resolution merely limited the legislature’s ability to divert funds from dedicated open space. Even Sierra Club lied about this in press release. Let me know if you want a link to that. I asked your permission to take the photo before I took it. I don’t need your permission to post it on line, you were in a public place (a stream – all waters of the state are public resources).). I did not slander GSWA – everything I said here is absolutely true. I did criticize them. YOu di know that a knowingly false accusation of slander is defamatory, right? You are accusing me of slander, I specifically provided the factual basis for my statements. BTW, the KIG coalition had a responsibility to tell the truth about the cuts. Instead they lied about them. To remedy that, they now have an obligation to support restoration of the cuts. They failed to do that too. I am fully aware of the coverage of the DEP water quality monitoring and assessment network, as I’ve been involved in that work for almost 30 years. Cutting millions of CBT dollars dedicated to the WQ program and DEP staff positions makes that coverage even worse. Perhaps you should read the DEP documents before you try to create the false impression that your monitoring somehow supplements the DEP’s work. AS I said in the post above and the prior response to your comment, had you read those documents you would have known that the data can’t be used. Finally, your comment is very revealing of the entire KIG dynamic. Ignorance compounded by arrogance and selfishness. It takes one hell of a nerve to take DEP resources for your won organization’s benefit and then lie to the public about it. Then, when you are called out on it, you make more misleading claims and false attacks on the critic who called you out. I don’t understand what DEP resources GSWA gained from the open space, and when did they lie about it? Sorry, just now getting to your comment. This post is about the Keep It Green Coalition. The GSWA volunteers are used to illustrate the hypocrisy of the cuts to DEP water programs, in that GSWA is engaged in something that they are actively cutting resources for. GSWA also is an example of the lies that were told because these volunteers were not only unaware of those cuts but were told by GSWA leaders that the cuts were merely administrative “reshuffling”of accounts, not cuts. The multiple lies were by the Keep It Green Coalition – GSWA is a member, so they are accountable for all done in their behalf. The lies involved whether the Open Space ballot question would divert funds from current Parks and environmental programs at DEP and cause detrimental impacts. The KIG coalition member groups benefit financially from the Open Space program. Hope this answers your questions – if not, search this site for multiple posts on these issues.